The handsome fella with hearts instead of wings. Incorrigible dreamer and optimist. ( The glass is always half full ). Perfect companion for toddlers and best friend of grown ups! If you’re wondering what is this yellow spot with a shiny gem in the middle… STOP right now! This is beautiful yellow flower made from crimped paper strip! YES, this is FLOWER! Very nice to meet you, Johnny the Bird! 🙂 I can’t believe how much sweetness you packed in this frame, Iza! Hearts instead of wings… really, how adorable is that?! P.S. Loving the new look of your blog! 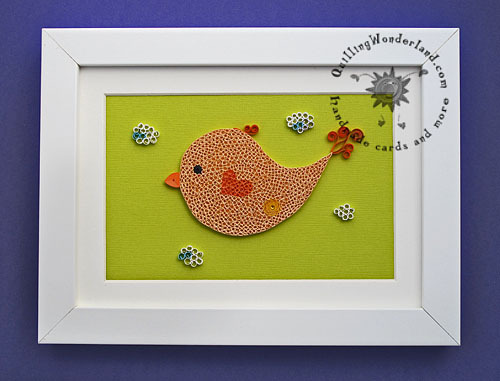 Quilling by Quilling Wonderland is licensed under a Creative Commons Attribution-NonCommercial-ShareAlike 3.0 Ireland License. All rights owned by Iza for Quilling Wonderland. 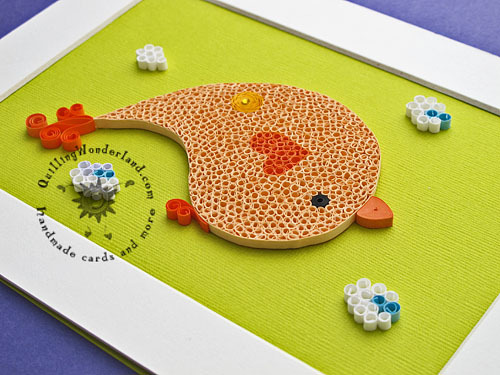 All content of this blog is copyrighted © by Izabela Stepkowska/Quilling Wonderland 2012 - 2014, unless stated otherwise. 1. Using any of the share icons at the bottom of each post, page, etc.